Join the discussion on our forums! Come discuss The Beast Within over in our dedicated The Beast Within discussion topic. Serious... Can I dust it? My minion can attack twice. SWEET. It's subpar with the beast restriction, it might almost be god-like without the restriction. I'll keep the restriction. The Beast within... the Beast? 1. Does attack trigger if the Beast already attacked? 2. Can I still attack with the Beast after I used this card? Really terrible card then. Should always work as a windfury on the minion. Steal the text from a MTG card and screw up the effect. C'mon Blizzard!!! Also kind of neat with anything that rushes or charges as you get an extra attack. 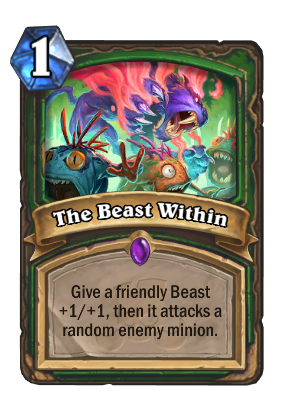 Usually I would say this is bad because Hunter has no card draw and can't rely on a combo card that works best with very few specific minions...but we got MAster's call now, which encourages you to build a beast only deck...in which Cave Hydra could very much fit into. So yeah, maybe not just memes and dreams. Well, they really like to make hunter minions attack lately. Thyat might be pretty fun. For hunters. The beast within can only be played on a best. Outside and inside 100% beast.